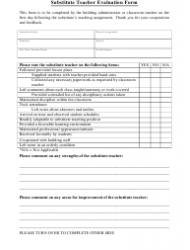 A teacher evaluation form is a document used either by students for assessing the performance of teachers or - less commonly - by teachers to evaluate the performance of their students. 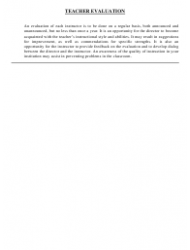 Regular evaluation is necessary for schools that wish to maintain a high quality of education. The assessment is usually conducted regularly, at least twice a year, with unannounced evaluations taking place in between scheduled ones. 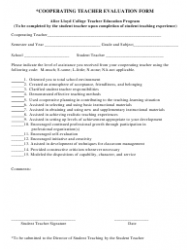 Teacher evaluation is a process that allows teachers to improve and keeps students engaged in the learning process. 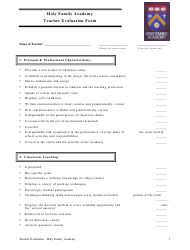 Schools collect information from the students, perform in-class observation and ask teachers to perform self-evaluations in order to properly assess their performance. 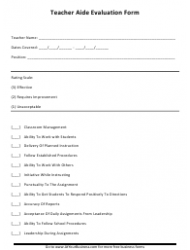 A teacher evaluation template facilitates the process, providing a standard tool for gathering all the necessary information. 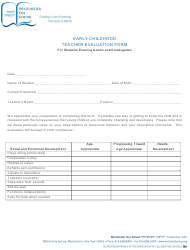 All evaluation forms require the name of the teacher and their course. 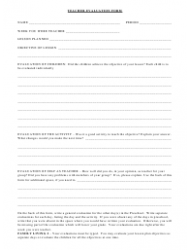 Information about their performance and the student's progress is collected in the form of statements. 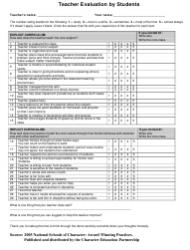 The student has to agree or disagree with a number of open-ended questions. The participating students are kept anonymous in order to avoid conflicts and receive honest feedback. Students may provide additional commentary or remarks as they see fit. The information gathered from the feedback submitted by the students helps the school become better acquainted with the strengths and shortcomings of their teaching staff. The evaluation process usually includes recommendations for future development or coaching. 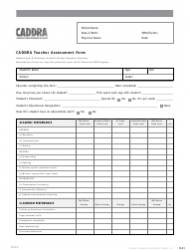 This is a three-page CADDRA Teacher Assessment Form from the Canadian ADHD Resource Alliance. 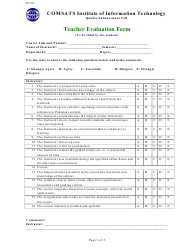 It is a very dense professional assessment form dating from 2014.